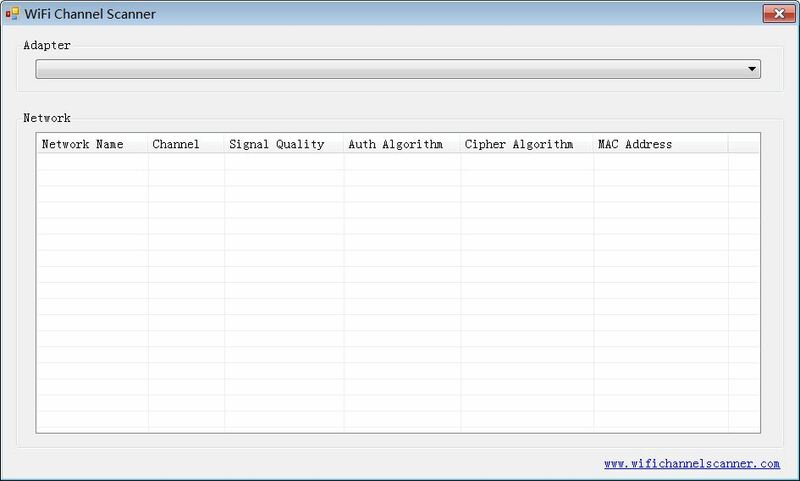 WiFi Channel Scanner is a free WiFi network scan tool, it can quickly search and identify WiFi hotspots around you. It will provide all important WiFi network information, including network name (SSID), channel, signal quality, authentication algorithm, cipher algorithm, MAC address and more. Users can view real-time signal quality for the current WiFi hotspot, easily choose the most stable wireless network. Ensure that your wireless network card has been installed correctly and is not disabled. If your computer have multiple wireless network cards, you can use the drop-down box "Adapter" to select. Wireless network data will automatically refresh every 3 seconds. A Wi-Fi signal can occupy different channels, if multiple wireless routers broadcast on the same channel (same frequency), the transmission data will maybe interfere with each other, this is called "Channel Conflict", you should change the WiFi channel number to avoid interference. The wrong channel settings will make wireless networks can not be connected or have poor signal. This software is a convenient scanning tool, can quickly explore all available WiFi signal channels. By using it, you can select a best channel number for your wireless routers, and improve the speed of wireless network. Copyright © 2012 www.wifichannelscanner.com, All Rights Reserved.